Quartz-crystal design is accurate to 0.0005%—over 100 times more accurate than other stopwatches. Times to 19 hours, 59 minutes, 59 seconds, and 99 hundredths. Triple display shows cumulative splits, interval splits, and running time. Precise, Traceable® timing for enzyme tests, viscosity measurements, animal studies, and all timed lab tests. Made for scientists in industrial, educational, hospital, and governmental labs who insist on the finest instrumentation. Engineered for ease of operation, accuracy, and reliability. 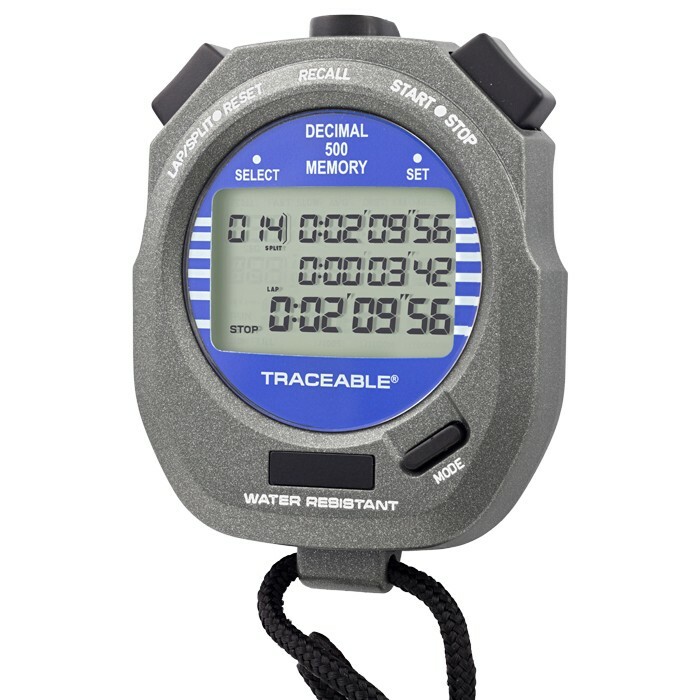 Features 500 recallable memories displaying the lap, split and running time. Memory feature also displays the fastest, slowest, and average lap time. The unit displays time of day, date, day of the week and features a time-of-day alarm. Additional features include countdown alarm, countdown then countup alarm, countdown repeat, pacer, and stroke functions. Tough, water-resistant ABS plastic case features tongue and groove craftsmanship and O-ring construction to seal out moisture, dust, and fumes encountered in harsh lab, plant, or field environments.